Although there was a portion considered that flooded area was interpreted narrowly a little in the western part, for other areas, the Tsunami Disaster Map well captured the reality, and it was also in agreement with the general condition of the flood area by the Geospatial Information Authority of Japan, and has judged that it is mostly reliable (Photos 1-9). The Tsunami Disaster Map was verified to be reliable in this area as well. “Heavily damaged residential area” in the Tsunami Disaster Map, however, partly disagrees with the area where most of buildings are seriously damaged. Within about 500m inland from the seashore, many residential wooden buildings were washed away and we found the footprints of tsunami in the remained buildings which showed the depth of tsunami of this area was over 3m (Photos 10-11). There were buildings that can be regarded as ‘completely destroyed’ in the Fish Processing Industrial Area, although their steel frame portion and roof remained (Photo 12). In Nagahama district, about 200m width pine tree-fences are planted. It was thought that the tsunami flow became weaker in the back of tree-fence, and there was less damage of educational establishment than that in the Fish Processing Industrial Area (Photo 13). In this area, the damage in which many of houses are washed away in the southern part of the Hiyoriyama Hill, in accordance with the Tsunami Disaster Map. On the Old Kitakami river right bank, it seemed that land subsidence took place and flood area still now was seen (Photos 14- 15). It is thought that the strength of the tsunami flow became weaker as it went north, and the rubbles of building were no longer seen. It seemed that the depth of tsunami flood was over 1m also near the central shopping district (Tachimachi), and the range of inundation above the floor level has prevalent. The southern part in this area is still flooded over the large range even 3 weeks after the disaster, since the land subsidence of more than 50cm occurred. Most of houses, however, remained in the inland area where industrial buildings, such as a factory, are locating on the waterfront. These industrial buildings seem to have weakened the flow of tsunami. We found the more than half of the houses washed away in Nakajima-cho where residential district faced shoreline directly. In the Tsunami Disaster Map, although the flooded range is mostly classified as "the heavily damaged residential area”, there are also many portions which were farmland. We thought, it is difficult to interpret whether the flood area is farmland or water covered remnant of wooden residential buildings (Photo 16-17). In this area, the Sendai Tobu Highway is elevated 6m higher than farmland and residential areas. Although the large part of the Sendai Tobu Highway is mounted, a part of the Highway is elevated bridge. The east side of the laid earth highway mostly serves as a limit of the flood area. The depth of flood was considered to be 2m or less (Photo 18). It seemed that the strong and narrow tsunami flow to the west happened through underpass of the Sendai Tobu Highway, and underpass’s width is about 4m. We found drift vehicles in the west side nearby the Sendai Tobu Highway (Photo 19- 20). The investigation of the residential area of the east side of the Sendai East Highway was not completed because of the restriction of entrance, in Fujita district, it seemed that the depth of flood was less than 1m, and the collapse of the house was not seen there. In the west side of the elevated highway portion, the depth of flood was considered to be less than 1m and inundation in many of houses in Shimo-Iida were above the floor level. 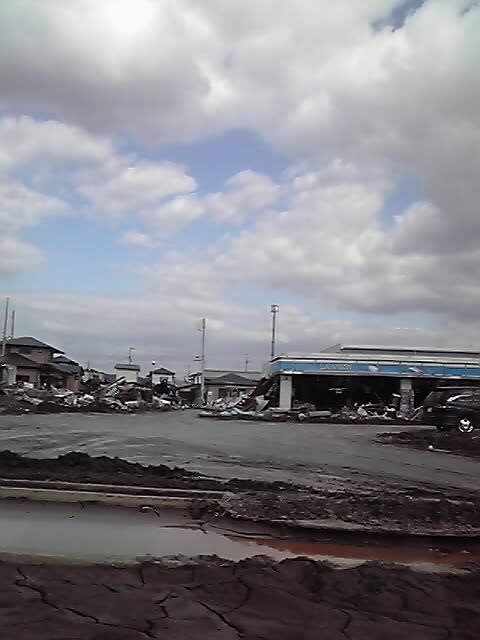 It seems that the flooding remained under floor Rokugo district (Picture 21, 22). The Tsunami Disaster Map of this district is mostly verified. The strength of tsunami flow, however, depends on the structure of the Sendai Tobu Highway; whether it is mounted or elevated. We can identify partly the strength and depth of tsunami flow by checking the materials of wreckage (vehicles, trees or grass). 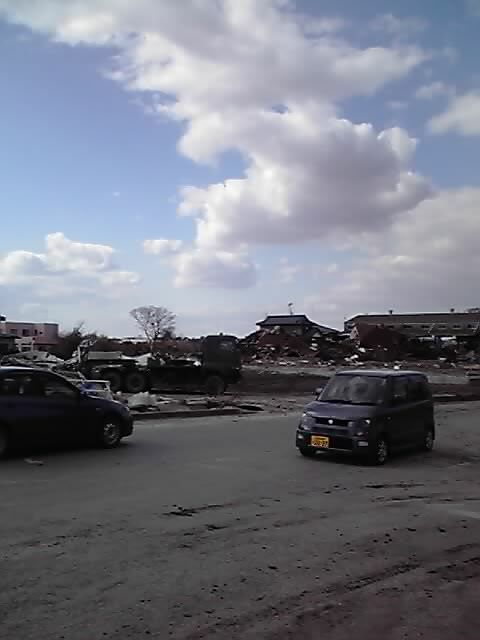 The distribution of damaged vehicles should be good indicator of the boundary of strong and deep tsunami inflow (Picture 23).